Released in 2017 to coincide with national ‘Canada 150’ celebrations, Jay Sherwood’s Surveying the Great Divide also affords an opportunity to reflect on a period of productive inter-provincial cooperation a century ago, at a moment when strained relations between Alberta and British Columbia continue to make headlines. The book tells the story of the substantial collaborative effort to survey and demarcate the provincial boundary along the Great (Continental) Divide between 1913 and 1917. Spurred by the presence of coal, timber, and other exploitable natural resources, Alberta and British Columbia were keen to define their precise territorial limits amidst the peaks and high passes of the southern Rockies. The work was carried out by two survey parties: A.O. Wheeler (BC’s representative) determined the boundary line along the mountain peaks, while employing phototopography to record and map the rugged country a few miles to either side of the line; R.W. Cautley (Alberta’s representative) was responsible for surveying the line and building permanent boundary monuments in each of the mountain passes bisecting the Great Divide between the international boundary and Yellowhead Pass. The work produced several thousand photographs, the first detailed topographic maps of the Canadian Rockies, and dozens of permanent boundary markers (many still extant today)—a feat made all the more remarkable considering that much of this time—and resource-intensive work coincided with the young Dominion’s considerable war obligations in Europe. Readers familiar with Sherwood’s seven (!) 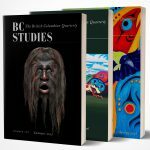 previous books on surveying in BC will know what to expect with Surveying the Great Divide: a thoroughly detailed and chronologically-organized narrative, largely woven from the first-hand accounts contained in the journals, personal correspondence, and official memoranda of the surveyors themselves. Supplementing this account are more than one hundred glossy black and white photos (several full page) depicting surveyors at work, completed boundary monuments, and—most spectacularly—sweeping panoramic vistas of majestic peaks and timbered passes. Frequently, these historical images are juxtaposed with contemporary ‘repeat photographs’ (also rendered in black and white) taken as part of the Mountain Legacy Project or by the author himself, which document notable changes to these alpine landscapes over the past century. While these lustrous photographs and Sherwood’s meticulous chronology combine to create a compelling account, there are shortcomings. The book could have provided more context concerning the political and economic motivations that called forth and perpetuated the survey (albeit with reduced funding) throughout World War I, at a time when scarce resources would have been expected to have been fully funnelled towards the war effort. Sherwood touches lightly on these broader issues in places, but the analysis rarely strays any appreciable distance from the daily routines of our intrepid surveyors in the field. The five dense chapters at the heart of the book, documenting the survey’s annual field campaigns between 1913 and 1917, could each use a large-scale reference map, detailing the ground covered by Wheeler and Cautley’s survey parties that season. Curiously, the exacting work of transforming field notes and photographs into polished maps and reports each winter receives only cursory mention throughout the book, despite being a fundamental aspect of the surveyor’s craft. More elaboration would have been welcome. Ultimately, the book falls somewhat short of providing, as it were, the panoramic view from the mountaintop when it comes to assessing the full scope and significance of this monumental survey. Instead, Sherwood’s account frequently remains below the proverbial treeline, hemming readers in with a dense thicket of detail concerning routes traversed, duties discharged, and the daily vicissitudes of camp life. Halfmoon Bay: Caitlin, 2017. 160 pp. $29.95 paper.